Prepare Betty Crocker Golden Vanilla cake as directed, but substitute Parkay Squeeze (which is liquid at room temperature and chilled) for the oil and whole milk for the water. Add two teaspoons of good vanilla extract. Naturally, I went out and bought Parkay Squeeze the next day. The store was out of Betty Crocker Golden Vanilla, so I used French Vanilla and made giant Boston Cream Pie cupcakes using Wayne’s recipe as the base. They were good! Still, I felt like I was cheating so I decided to make another batch using a scratch base. Here it is. Feel free to swap out your favorite doctored cake mix for the cake part of the recipe. But if you want to go the scratch route, this recipe is really easy and makes a good cake. I used White Lily’s Butter Yellow Cupcake recipe, but baked the cakes at a lower temperature and used a mixing method called “Two Stage” which produces a tighter crumbed cake that doesn’t rise as much yet is still light. It worked perfectly, though I think Martha Stewart’s Buttermilk Cupcake recipe would also make a great base. The filling is “straight up” cook & serve vanilla pudding (but instant would be fine), and the topping is one of my favorite scratch icings. And while I was at it, I did a chocolate version using White Lily’s Favorite Chocolate Cupcake recipe as the base. Or forget all the scratch recipes and just try Wayne’s crazy Parkay Squeeze version. If you do, let me know what you think. I could still taste the artificial vanilla flavor from the cake mix, but I grew up eating that flavor so it didn’t really bother me. And if you do try it, don’t be too put off by the smell of the Parkay Squeeze. It doesn’t smell great on its own, but it works in the cake. 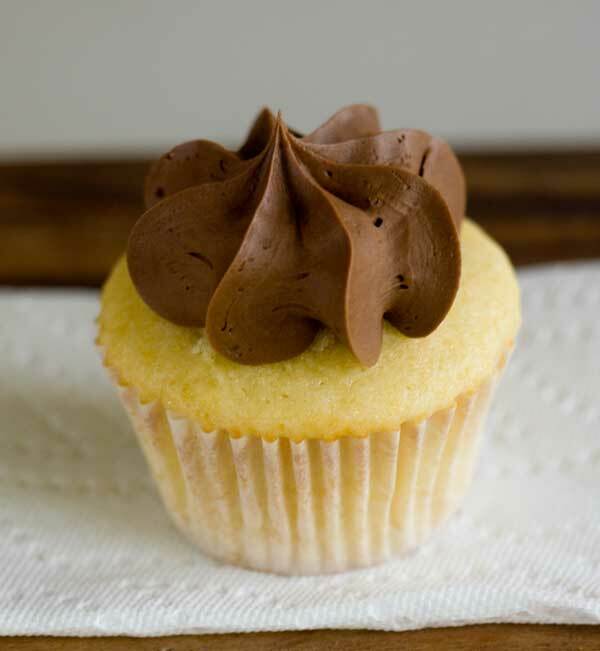 Vanilla cupcakes filled with vanilla pudding and topped with chocolate frosting. Cakes – Use this recipe or your favorite doctored cake mix recipe. Preheat the oven to 325º F. Line 12 muffin cups with paper or foil liners. Stir the flour, baking powder, salt and sugar together in a mixing bowl. Add the butter and mash it around until it coats the dry mixture, then add vegetable oil. Mix the beaten eggs with about 2 tablespoons of the milk and the vanilla. Add the egg mixture to the flour mixture and stir to incorporate. Now gradually stir in the remaining milk and beat with the mixer on medium speed for about 1 1/2 minutes. Divide batter evenly among muffin cups (cups should be a little over half full). Bake at 325 for 20 to 25 minutes or until toothpick inserted in center comes out clean. Cool in pan 5 minutes. Remove to wire rack and let cool. While cupcakes are cooling, prepare pudding mix according to package directions. Let it cool. 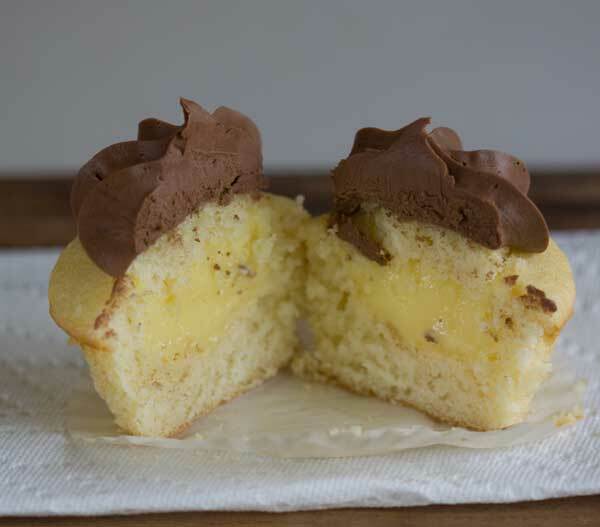 Carve a small well in each cupcake and reserve just the top part of the little piece that you pull out. Spoon pudding into the well, then cover the pudding with the top part of the cut cake. Or you can just skip doing that altogether and pipe icing directly over the pudding. Chill the cupcakes while you make the icing. Melt the two chocolates together in the microwave using 50% power and stirring every 30 seconds. Set aside to cool slightly. Beat the softened butter with the sugar until creamy and smooth. Beat in the cocoa powder and vanilla. Stir in the melted chocolate. Beat on high with the electric mixer, adding milk as needed. Spread the icing over the cupcakes or put the icing in a decorating bag and pipe it on with your favorite tip (mine is a closed star). Alternatively, you can put it in a zipper bag, cut off the bottom corner, and pipe it on as a big dot. Don’t bother using anything other than White Lily or cake flour. Regular all-purpose won’t give you quite the same results. This scratch recipe only makes 12 cupcakes so you'll have leftover pudding. If you are like me, you might want to make a batch of chocolate cupcakes as well, in which case you can use the pudding to fill those. If you use a doctored cake mix recipe instead of scratch, you'll have just enough pudding. 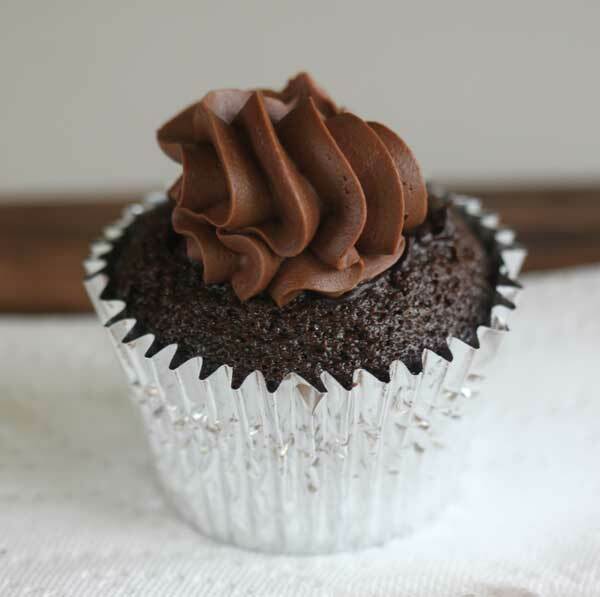 If you decide to make more than 12 cupcakes, double the chocolate frosting recipe. Oh Anna! My 6th Boston marathon is 10 days away. You know I have to celebrate by making these as soon as I get back!